Barbara Beyer studied worship music in Sydney and Protestant theology in Berlin. 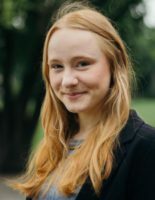 She is doctoral fellow of the BerGSAS within the program Ancient Languages and Texts (ALT) and within Topoi`s research group (C-2) Space and Metaphor. Her doctoral thesis deals with the formulation of the being “in Christ” which was one of the most famous and concise phrases of the apostle Paulus. This investigation is lead by the following questions: What did Paulus mean by this phrase? What purposes lay behind this thinking and how did he conceive the way of understanding this phrase?